I am always looking for do ahead potato dishes for dinner parties. A classic and familiar pairing of chives and Gruyère cheese makes these everyone’s favorite. I use a green scrub pad and an olive oil based bar soap to clean the potatoes because the skin is the best part. 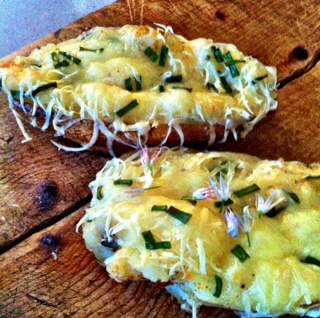 This entry was posted in Recipes and tagged chives, gruyere cheese, Make ahead, Potatoes. Bookmark the permalink.